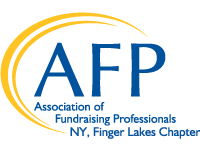 AFP NY, Finger Lakes Chapter provides connections and access within our region’s fundraising and development field. Job seekers: find out about job opportunities available in our region. Employers: reach the most qualified candidates to fill your open positions. Post a job opening here (no charge). Email, Amy LeViere, webmaster at aleviere@cftompkins.org Please include the job title, organization and weblink to your organization's site job post.